Whether in its full motion picture format, documentary or short films, we all know that movies can bring a different kind of inspiration in our lives. My former boss, the late great National Artist for Film Eddie Romero believed that films are the best repository of culture as it mirrors and present the past, present and future of a given people and their country. For Romero, it is a powerful tool for change and movement. 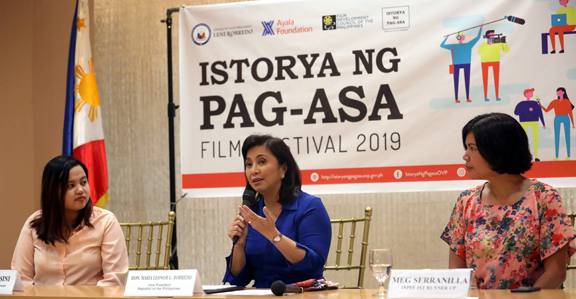 Now, I no longer wonder why the Office of the Vice President Leni Robredo utilizes not only the potential but the power of film in bringing stories of hope to the consciousness of every one. VP Leni Robredo with last year's winners of Istorya ng Pag-asa Film Festival. Since “Istorya Ng Pag-Asa Film Festival 2019” will present short films that will highlight regular Filipino with aspirational and inspirational stories, my curiosity led me to inquire who were her favorite actors and actresses. Fast forward to the present, the actors she likes nowadays are Piolo Pascual and John Lloyd Cruz. Watching Filipino films is her therapy of sorts, her mode of unwinding after all the grueling activities she has to attend to as the second most powerful person of the Republic. Winning short films, aside from the bragging rights and showing in all Ayala Cinemas prior to the screening of a main feature, will bring home P80K (best short film), P50K at P30K for second and third best short films. Congratulations to VP Leni Robredo and the Ayala Foundation for this festival, Hope springs eternal indeed for Filipinos from all walks of life because of your quest to highlight the goodness and greatness of Pinoys who find meaning and hope even when they face the most trying of predicaments. Is your favorite film, actor or actress the editors’ choice?